"Ideally you would make this in the middle of summer with ears of fresh, sweet-as-sugar corn. 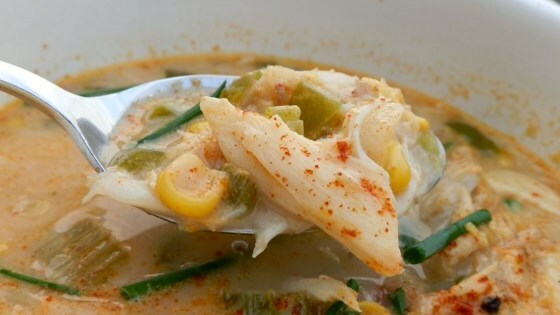 You can also make a perfectly fine version of this chowder using a premium-quality, extra-sweet, frozen corn." Melt butter in a Dutch oven over medium heat; stir in onion, jalepeno peppers, celery, and a pinch of salt. Cook until onions are soft and translucent, 7 to 10 minutes. Stir seafood seasoning and cayenne pepper into onion mixture; cook for 30 seconds. Sprinkle flour over onion mixture; cook and stir until mixture is slightly thickened, about 2 minutes. Pour 2 1/2 cups water, 1/2 pound corn kernels, and 2 ounces crabmeat into the onion mixture; increase heat to medium-high and bring to simmer. Place 1 cup water, 1/2 pound corn kernels, and garlic into a blender. Cover and puree until smooth. Pour corn puree into the Dutch oven and bring mixture to a boil. Reduce heat to low; simmer until chowder is thicker and the color deepens, about 45 minutes. Stir 6 ounces of crabmeat, paprika, and heavy cream into chowder. Season with salt and pepper to taste; garnish with green onions and a pinch of cayenne pepper. This is amazing!! Just like I had in a New Orleans restaurant I had last week!!! The next time I make this, if I do, I won't use a 1/2 cup of jalapenos. That just seemed like heat for the sake of heat. It also buried the paprika & Old Bay. I'll keep it for inspiration. Lol. I haven't made this yet but definitely in my "on deck" list. Y'all know that removing the seeds and ribs from the jalapeños tames the heat,yeah? Know your ingredients!